When King Charles II of England married Princess Catherine de Braganza of Portugal in 1661, he received as part of his dowry the isles of Bom Bahia, the Good Bay. Reclaimed from the sea, these would become the modern city of Bombay. A marriage of affluence and abject poverty, where a grey concrete jungle is the backdrop to a heady potpourri of ethnic, linguistic and religious subcultures, Bombay, renamed Mumbai after the goddess Mumbadevi, defies definition. Bombay, Meri Jaan, comprising poems and prose pieces by some of the biggest names in literature, in addition to cartoons, photographs, a song and a Bombay Duck recipe, tries to capture the spirit of this great metropolis. Salman Rushdie, Pico Iyer, Dilip Chitre, Saadat Hasan Manto, V.S. 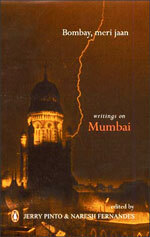 Naipaul, Khushwant Singh and Busybee, among others, write about aspects of the city: the high-rise apartments and the slums; camaraderie and isolation in the crowded chawls; bhelpuri on the beach and cricket in the gully; the women's compartment of a local train; encounter cops who battle the underworld; the jazz culture of the sixties; the monsoon floods; the Shiv Sena; the cinema halls; the sea. Vibrant, engaging and provocative, this is an anthology as rich and varied as the city it celebrates.